Croton petra (Codiaeum variegatum), with waxy, stiff leaves striped, spotted or mottled with bright combinations of red, yellow, bronze and dark green, is a splashy plant that is sure to attract attention. A tropical plant, croton petra will grow outdoors if you live in a warm, humid climate, but the plant won't do well if the temperature drops below 40 degrees Fahrenheit. For that reason, croton petra is usually grown as a houseplant. Take good care of your croton petra, and the colors will remain vibrant year-round. Plant croton petra in a container with a hole in the bottom so that water can drain freely. Fill the container with commercial potting soil. Place the croton petra plant where it will get at least six hours of bright sunlight every day. Avoid windows where the plant will be exposed to direct afternoon light, which may be too hot. Water croton petra only when the top of the soil is dry to the touch. Too much water can cause the plant to drop its leaves. However, if the leaves look wilted, the croton petra may need a bit more water. 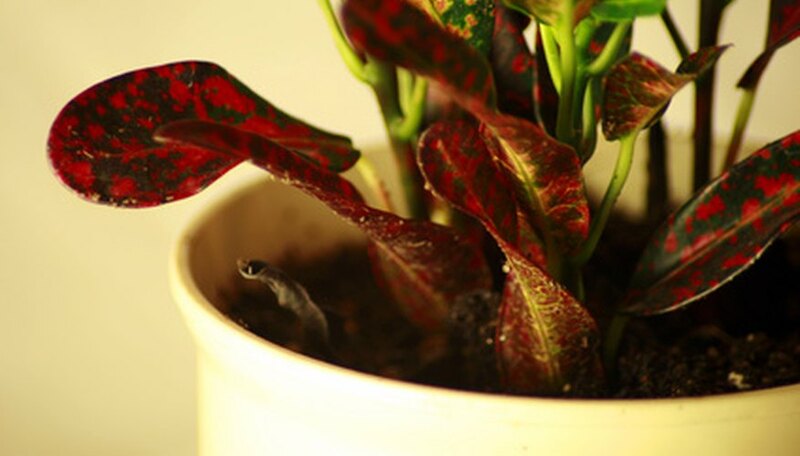 Feed croton petra a water-soluble houseplant fertilizer every other week at watering time. Croton petra doesn't require much fertilizer, and will do best if the solution is diluted to half strength. Keep the croton petra plant where the room temperature won't drop below 60 degrees Fahrenheit. Croton petra can tolerate temperatures as low as 45 degrees Fahrenheit for a short time, but soon the plant will be damaged by the cold and will eventually die. Keep the croton petra plant neat and tidy, which will help to prevent disease and pests. Remove any wilting and yellow leaves, and don't let leaves and plant debris pile up in the container. Increase humidity around the croton petra plant by placing the plant on a tray or saucer with a layer of pebbles or gravel and water. Be sure the bottom of the pot is sitting on the pebbles or gravel, but not in the water. If you live in a warm, humid climate, plant croton petra in a sunny location, in well-drained soil. Water the plant whenever the top of the soil dries out. Be careful with croton petra if you have small children or animals. All parts of the croton petra plant are toxic, and can cause nausea and vomiting when ingested. The sap from the leaves and stems can sometimes cause skin irritation and can stain clothing.